This event is present in ancient literature like The Illiad, the Polchronicon and the poems of Hesiod. This rain generally covers very small pieces of land. It can last for many days or a short period of time. 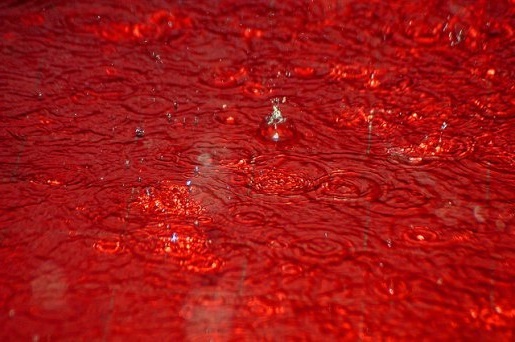 Till the 17th century, people believed the red color of the rain was due to the fact that the water which fell from the sky was actually blood. When this phenomenon happens it has the capacity to coat cars, furniture and houses along with stain clothes. After the rain dries, it leaves a thin layer of dirt, which maybe red in color. The recent developments in technology enabled the scientists to properly study this phenomenon. Theories to the cause vary greatly. One suggestion is the rain is caused by the aerial spores of Trentepohlia annulate, a microalgae. The spores of this algae are release into the air where they accumulate then are caught in precipitation and disposed to a large area in Another theory is the sand particles of the desert are picked up by the violent winds and they combine with the moisture which is present in the clouds. These particles cause the rain to turn red resulting in the abnormal event. Some also say that these rains could be caused caused by the dust of meteors and extraterrestrial life. There have been many incidents reported in the past involving blood rain The most modern known case is said to be the one that took place in Kerala, a southern state of India in 2001. It began on 25 July and ended on 23 September 2001. The rain is said to have deposited nearly 110,000 lbs of red particles in the state. Blood rain also fell in Monaragala, Polonnaruwa and Sevanagala of Sri Lanka on November 14th and November 15th 2012. A recent occurrence of red rain took place in the province of Zamora in Spain during the autumn months of 2014. Excellent post! This is such a cool phenomena! Thanks Mae. Got a few other unusual phenomenon I’m researching to post in the near future. People will always say it is a bad omen if things are un-explainable to them. The Scientists look for a plausible reason…..